Berlin, 1939. The Hot Time Swingers, a popular jazz band, has been forbidden to play by the Nazis. Their young trumpet-player Hieronymus Falk, declared a musical genius by none other than Louis Armstrong, is arrested in a Paris café. He is never heard from again. He was twenty years old, a German citizen. And he was black. Berlin, 1952. Falk is a jazz legend. Hot Time Swingers band members Sid Griffiths and Chip Jones, both African Americans from Baltimore, have appeared in a documentary about Falk. When they are invited to attend the film's premier, Sid's role in Falk's fate will be questioned and the two old musicians set off on a surprising and strange journey. From the smoky bars of pre-war Berlin to the salons of Paris, Sid leads the reader through a fascinating, little-known world as he describes the friendships, love affairs and treacheries that led to Falk's incarceration in Sachsenhausen. 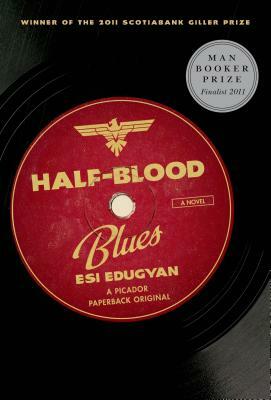 Esi Edugyan's Half-Blood Blues is a story about music and race, love and loyalty, and the sacrifices we ask of ourselves, and demand of others, in the name of art. Esi Edugyan has a Masters in Writing from Johns Hopkins Writing Seminars. Her work has appeared in several anthologies, including Best New American Voices 2003, edited by Joyce Carol Oates, and Revival: An Anthology of Black Canadian Writing (2006). Her debut novel, The Second Life of Samuel Tyne, was published internationally. It was nominated for the Hurston/Wright Legacy Award, was a More Book Lust selection, and was chosen by the New York Public Library as one of 2004's Books to Remember. Her novel Half-Blood Blues won the Scotiabank Giller Prize and was a finalist for the 2011 Man Booker Prize. Edugyan has held fellowships in the US, Scotland, Iceland, Germany, Hungary, Finland, Spain and Belgium. She has taught creative writing at both Johns Hopkins University and the University of Victoria. She lives in Victoria, British Columbia. To what end does the novel take the reader back and forth in time and place, from Berlin to Paris in the 1930s and 40s and Europe in the 1990s? How does this affect the reader? Delilah is a major female character in an otherwise largely malepopulated novel. How does she push against the gender relations in the novel, and how does her romantic involvement with the other characters affect the reader’s sense of her character? Would you describe her as an early feminist? Do you think that Sid, the narrator, is at the heart of Half Blood Blues? Whose novel is this? Half-Blood Blues explores, among other things, the jazz era of the 1930s. In what ways does jazz affect the novel’s structure, the voice of its characters, the tone of the book? One reviewer criticized the novel on the grounds that the Afro-German experience has been sidelined. How does telling Hiero’s story from the point-of-view of a different character affect it? What are the moral implications of doing so?